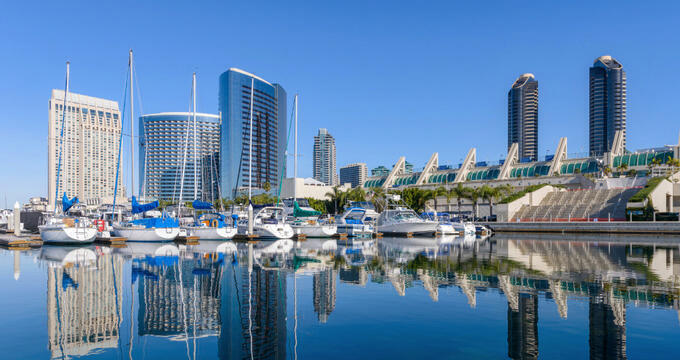 Nicknamed ‘America’s Finest City’, San Diego has a lot to offer every single visitor. The city is perhaps best-known for its world-famous zoo, but there are many other attractions to be found in and around San Diego like SeaWorld, Legoland, and Balboa Park, as well as a long list of highly rated bars and restaurants. Beautiful beaches and incredible surrounding scenery only add to the incredible list of reasons to visit San Diego, and this part of the state is also known for its endless sunshine and high temperatures, so it’s no surprise that California’s second largest city sees huge numbers of tourists throughout the year, every single year. If you’re thinking about visiting San Diego, there are a lot of different factors to consider. Your method of transport, form of accommodation, and list of desired activities are all important aspects of your trip, but it’s also essential to choose the right dates. The weather in San Diego tends to be quite sunny and warm for most of the year, but temperatures can drop down to mild levels in certain months, and the city can get relatively rainy too. Too much rain could ruin your trip, especially if you want to visit San Diego’s outdoor attractions. So, with that in mind, let’s take a closer look at San Diego weather in March to see if that might be the right month for your visit. March symbolizes the arrival of spring. It's a happy time of year for many people, with flowers starting to bloom and new life in nature, and the temperatures are also starting to rise in many locations too. San Diego is no exception to this rule. The average daily temperature in March for San Diego is 59 °F (16 °C), which is just a little higher than the average in January and February. The air starts to feel a little warmer at all times of day in San Diego in March, even in the evenings. The average highs for this month are 66 °F (19 °C ) and the average lows are just 53 °F (12 °C), so even when it gets cool, it's never too cold, and this all means that visitors to San Diego in March can enjoy staying out a little longer without having to worry about wrapping up in lots of layers and big coats. Temperatures in March in San Diego tend to start off low and get progressively warmer over the course of the month, with the warmest temperatures being seen in the final days of March. For example, the average temperature on March 1 is 61 °F (16 °C), whereas the average on March 31 is 63 °F (17 °C). In terms of precipitation, March is quite a wet month for San Diego but nowhere near as rainy as the previous month of February. On average, around 38mm of rain can be expected to fall in San Diego in March across an average of seven days. This means that it may be difficult to visit some of San Diego’s popular outdoor spots like the beaches and zoo, given the likelihood of rain. The final weather statistic to consider for San Diego in March is sunshine. The city is known as being a very sunny place, but March is one of the darker months of the year, with only eight hours of sunshine recorded on average each day. This is the same as the previous month of February and the following month of April. Since the temperatures are getting slightly warmer, March isn't a bad time to visit San Diego for walks around the city and along the beaches, or for visits to some of the popular outdoor areas like the San Diego Zoo. In the Gaslamp quarter, a Mardi Gras festival is also held in March in San Diego each year, which is one of the city's most popular annual celebrations. St. Patrick’s Day is also popular in San Diego, with lots of parties and events going on. However, given the reasonably high chance of rain showers and the temperatures that are still relatively mild, many visitors to San Diego in March will prefer to remain indoors. Fortunately, the city is home to lots of great stores, bars, eateries, and more, as well as dozens of different museums and art centers. Lots of live entertainment venues can be found around San Diego too, so there’s always something fun going on each day and night.